The month of April passed by so quickly. Its funny yet terrifying to know that we are almost through the half of 2016. I still haven't blogged that much for April because of procrastination and busy schedule but I am happy to announce that April has been the highest month for unique visits this year. I am extending my appreciation to everyone who continuously enjoy reading SavingsPinay. And so let's begin our quick recap of the month April. My goal for April is to reach 120,000 pageviews however everyone showed greater love and attention with 123,000 from 117,000 last month. My target for May is 130,000pageviews and successfully publish 20 articles. Being a contributor to BrewYourBestYear is such an honor. I am glad that there is a new home for my posts where it could reach more people. Just last week my post, Anatomy of a Successful Budget was published. I hope you can check BrewYourBestYear to read it. I successfully hiked again!!! I am so happy adding Mt. Daraitan to my success list. I am determined to focus on climbing and have listed other mountains as well that I really want to climb. Mt. Daraitan is a hidden gem and I will surely come back again and make my experience even better. 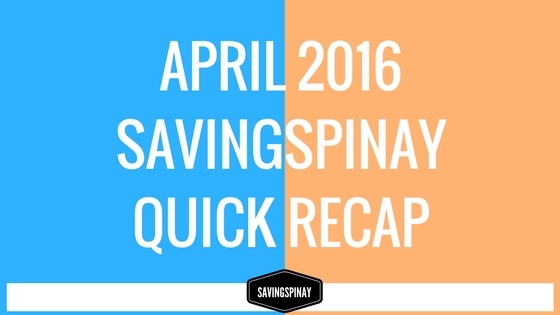 I have posted a Guide with Itinerary and Expenses here in SavingsPinay for your reference.